Here is my speech to the Another Europe is Possible conference (Another Europe is still possible: resisting hard Brexit & Trump) in Manchester on 1st April 2017. Good morning everyone and thank you very much for inviting me to speak today. And that’s what we are here to do today: to be challenged to think and act differently, to work out how exactly we can create another, better, Europe – one with social, economic, and environmental justice at its heart. And I am looking forward to today’s discussions, to hearing about your experiences and opinions on the current shambles in which we seem to find ourselves, and thinking about how we can do and be so much better. 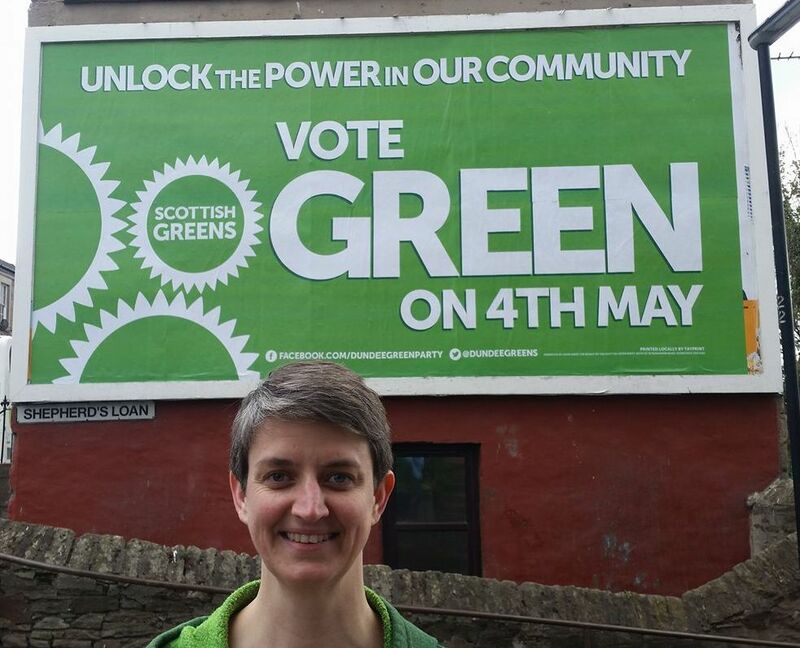 I am Maggie Chapman, Co-convener – co-leader – of the Scottish Green Party. I am an immigrant from the global south, and not a citizen of either the UK or any other EU country. I think it is important that we acknowledge who we are, to make us better able to use every weapon at our disposal to work together for a better world. So, as a Green, as a Scot – a Scot by choice – an immigrant from beyond the EU but one who looks and sounds (to those who care about such things) as if I belong here, and as a woman in politics, I have a voice and privileged position. I therefore have a duty, a responsibility, to use my voice and position as best I can to bring about the change I want to see in the world. But where are we all just now? Well, in the week in which Article 50 was triggered, a week after an attack on Westminster, things for us on the left seem very bleak. We know that the wealth gap is increasing. We know that austerity has punished many poor and vulnerable people. We know that many lives have been lost as a result. We know that immigrants are being targeted and blamed for failing public services. We know that racism and xenophobia are being nurtured by our media and political elite. And we know that those responsible for our economic and political uncertainty will be the last to pay the price for the destruction and havoc they have caused. The right has carefully built a coalition around Europe, regulation, immigration, blaming them for the UK’s failings. They’ve taken 40 years to do this. In reality, these things are all either good – regulations to protect people at work, immigrants who contribute so much to our communities and cultures – or in no way the problem that the right makes them out to be. But they’ve told people a really strong, convincing story, a very powerful narrative, about what’s wrong with their lives, their country, their world. And, importantly, they’ve told us who is to blame: immigrants, benefits ‘scroungers’, welfare cheats. The left has hoped that these fears would just go away, or would be rendered redundant by the fact that they were not true. In 2014, I ran for the European Parliament on a pro-immigration platform which almost everybody else thought was foolhardy. For too long they’d sat with their buttocks clenched as political debate resembled that family meal where you hope your racist uncle will just stop talking, because you’re too afraid, or can’t be bothered, to tackle his prejudice. Across the UK, Scotland was one of only two regions where Greens put their vote up. But it had a bigger effect than that – it forced the SNP into taking a pro-immigration stance publicly. That has, over the past three years, had a huge impact on the debate in Scotland. It became part of the independence referendum debate and, in no small part, contributed to the 62% remain vote in Scotland last June, where all 32 council areas voted to remain. The argument on immigration can be won – we just need to tackle it head on, instead of sitting with our buttocks clenched waiting for Nigel Farage, Paul Nuttall, Theresa May, or Donald Trump, to shut up. It is quite simple: we are not going to let our NHS be stripped of its workers, our schools be deprived of their staff, and our friends be wrenched out of our communities, just to satisfy bigots. It’s gone way beyond empty moaning to become a real threat to people’s lives. And we must recognise that immigrants are much more important to our communities than simply cogs in the labour market. Similarly, the right has told us that European regulation and red tape has led to public sector inefficiencies and prevented our national and local governments delivering the services we need. Regulations that save lives, protect our environments, and promote equality all face being discarded in favour of a laissez faire approach that we know will lead to greater inequalities, increased environmental destruction, and poorer standards of living. So we need to win this fight too – by highlighting the true benefits of regulation – but more importantly, by ensuring our citizens understand why these things matter. The only way we can do this is to change the way we do and think about politics: we need active, engaged citizens participating in democratic processes and discussions on a daily basis: it is too important to leave to 650 people in Westminster, or 129 in Holyrood, or to a Thursday in May every other year or so. For too long, we have left the garden untended – we have not made the case for what we want politically, but have instead chosen to avoid conflict. We need, now more than ever, to make the case for the world we want to see. And that is about building movements for participatory democracy, for a better environment, for workers’ rights, rather than hoping that some distant body will impose them upon us. Our societies have radical traditions running through them. In England you once beheaded your King. Now, I’m not suggesting regicide … but I am suggesting that we find those radical traditions and that we build a progressive politics on them. In Scotland, Tom Nairn and others made a start on this over 40 years ago, and the 2014 independence referendum allowed us to make clear progress on this. Maybe, just maybe, Brexit puts this need into sharp focus for the rest of the UK, and enables the kind of genuine engagement with politics that we so desperately need. We all know that the cause of the problems we face is a rigged economy – rigged because it delivers only for the 1%. The discontent that has focussed on Europe and on immigration is not caused by Europe or immigration. It is caused by alienation and a capitalist class running amok. If there is an upside to Brexit, it may be that it calls their bluff. Just as they built the story about immigration, regulation and Europe, so we need to create a story about the economy and society we want and need: an economy for people not profit. Local democracy: power in your hands! The Scottish Green Party’s Spring Conference is in Glasgow today, and I opened proceedings with this speech. Thanks to @FalkirkGreens for the photo – just some of the Council candidates at conference, with Patrick and me. Good Morning Conference! Welcome to Glasgow. And welcome to our Spring Conference 2017. Since we last met in Perth in October, so much has happened. We have a right wing fascist in the White House, who governs by diktat and seems content to rely on lies and prejudice to determine policy. 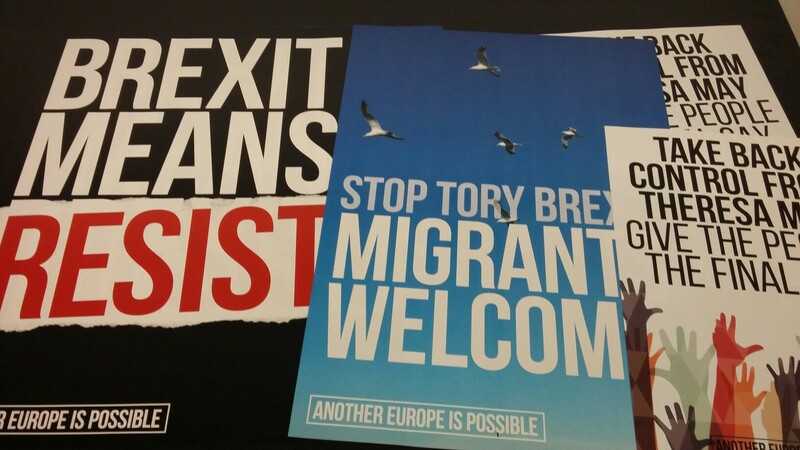 We have a UK Government determined to use immigrants as bargaining chips in Brexit negotiations, dividing communities and making more and more people feel vulnerable and marginalised. We have a PM who seems intent on turning her back on the people of Scotland by rejecting our right to be an ‘equal partner’ in discussions about our future relationship with the European Union. That old adage that in some weeks decades happen has clearly been borne out in recent weeks! But this last week has also seen the celebration of phenomenal and inspiring women as part of International Women’s Day on Wednesday. In various ways, women used their voices to highlight their often unseen and unvalued contributions to their communities, their worlds. And we used it to highlight just how far we still have to go to achieve equality. We’ve made huge progress as a society over the last century, but we still have to fight for equal pay, campaign for fair access to reproductive health care, and perhaps, more fundamentally, to feed our families, to house our neighbours. And we don’t need to look very far at all to see the consequences of inequality more generally: increasingly precarious employment leading to drug misuse and mental health issues; children from poorer backgrounds not achieving their potential in our schools; communities becoming increasingly isolated because of inadequate public transport; people living shorter lives because of poor housing. And that is what motivates me to do what I do day after day. And I am sure it is what motivates many, if not all of us, in this room. We Greens believe that the world can be different. That we can create the kind of societies that treat all members with dignity and respect, regardless of gender, background, age, or any other label or characteristic of identity. That we can harness the creativity and caring capacity in our communities, so that everyone can reach their potential, and lead fulfilling lives. And, as a political party, a crucial way in which we strive to create this different, better, equal world, is to engage with the structures of power and the communities in which we live, and stand in elections. In just 54 days, communities all over Scotland will go to the polls to elect the people who will run their Councils, making decisions about their health and social care, education, their cultural facilities, their housing and green spaces, and so much more. And it seems that we Greens are unique in taking these elections seriously for what they are: a chance to focus on our local democratic structures, that are in desperate need of renewal. Whilst the Tories and others are desperate to turn these elections into a referendum on independence, we want to talk about local democracy, local services, local powers. If the Tories want a referendum on constitutional matters, then let’s have a referendum on constitutional matters. But to turn the vote in May into an independence referendum is, quite frankly, insulting to to all those who believe in the importance of local democracy. And we do believe in the importance of local democracy. However, we also know that our Local councils in Scotland are not really local. The work our very own Andy Wightman and others like Lesley Riddoch have shown that we have the least local local democracy in Europe. Our citizens do not have the powers over their lives that would enable better decisions to be made, better services to be delivered, or better communities to be created. So we need to change that. And whilst we won’t be able to revolutionise the structures of our local councils on our own, we can be the champions for change and be the voices of renewal that our councils need. That is why, today, we come together as a party for one last opportunity to make sure we are as well prepared as possible for the 4th of May, and for what we hope will come after the 4th of May. We want more green councillors elected across Scotland. Greens who will fight for local democracy. Greens who will listen to the people they represent. Greens who will put power back in people’s hands. In our Holyrood campaign last year, in the approach we took in Green Yes and continue to take around questions of devolution and independence, we have always said that we don’t just need more power in Holyrood. We need more power in communities across Scotland. We know that Greens in local government, supporting and engaging people where they live and work, learn and play, are the best way of making that happen. It is so important that more people across Scotland have Greens to stand up and fight for them in their local wards. To listen to them. To give them a voice. To fight for the green principles of inclusive, participative politics. And to fight for the intertwined green values of social, economic and environmental justice for all. And we are working towards our biggest ever local authority election campaign, where we want to convert the success of becoming the fourth largest party in the Scottish Parliament last year to having more Greens elected across Scotland than have ever been elected in our party’s history. Just enjoy that thought for a moment … on 5th May, when all those votes and transfers have been counted, we hope to have more Greens elected than we have ever had in Scotland. What an opportunity! And what a privilege. Now, I know that it is not always easy to make the case for the kind of world we all want and need. As many of you know, I had the huge privilege of representing the people of Leith Walk in Edinburgh, and the Greens, as one of our first ever councillors, for 8 years. When I was a councillor, I wanted to give communities the right to decide how community grant money was spent. Not everyone agreed. They said it would result in worse decisions – because, as we know, politicians always know best, and never make mistakes. They said there would be very little interest. In the first year well over 300 Leithers of all ages turned up – surpassing everyone’s expectations – and Leith Decides has gone from strength to strength every year since. Participatory budgeting, as an idea, has taken off – not only in Edinburgh, but across Scotland – the Scottish Government has decided to put £2million into PB projects like £eith Decides across the country. Similarly, when I suggested a Living Wage for all Edinburgh Council employees, people got it confused with the minimum wage, argued it wasn’t practical, or just brushed it off as greens being utopian again. They thought it was not practical to pay workers a wage that enables them to live in dignity and comfort. Now, that once radical idea is seen as common sense across the political spectrum. And I am delighted that our candidates will be campaigning for a Living Wage Plus for those who care for our loved ones. Justice for our workers is most certainly a cornerstone of social justice overall. And there are lots of other examples of changes that we Greens have delivered for our local communities. I am thrilled that our long-term policy of a Citizen’s Income is at last being taken seriously, and I wish the Fife pilot all the very best. Green ideas are the future. We know that where we get greens elected, we bring these ideas into the open. We push them onto a wider stage. We find ways to show that our ideas work. And often, we find other parties quickly shift from mocking our proposals to pretending they always agreed with us. Every community across Scotland needs a local Green presence. The people of every Council in Scotland deserve Green councillors. And as we know, the job of the radical is to make hope possible. By electing greens across Scotland, this is a very real way in which we can make hope not only possible, but make change real. 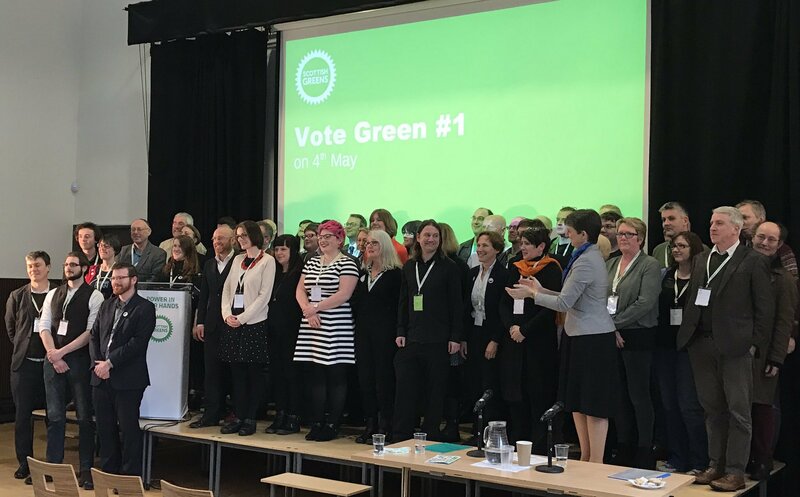 And come the 5th of May this year, with more Greens than ever before elected, we will have the opportunity – the responsibility – to ensure the green principles of participatory democracy and equality form the bedrock of our local government. We want to support and enable our communities to harness their creativity and use it for the good of everyone. Despite the problems and restrictions of current local government structures, we need to be doing so much more to enable the inclusive transformation of people’s lives. Our ideas can help us do this, but we can also learn from elsewhere. We can learn from people in Rojava, where, in the midst of war and desolation, they are coming together and building strong communities that reject hatred and oppression. From those in North Dakota who, seeking to protect their environmental and cultural inheritance for future generations, stood firm against state-sanctioned brutality. From those women in Dublin who were out on strike on Wednesday to secure rights over their own bodies and health. We can learn from these and many other examples of community. And we can stand with them in solidarity. Just as they stand up for justice, so we must continue to stand shoulder to shoulder with those facing the brunt of austerity: the economic violence that Westminster is using to discipline us. We know that austerity is an ideological tool used to hammer the poor. It was sold to us as a way to pay down the national debt. Yet Britain’s government debt has doubled since 2010. Someone, I can’t remember who, was fond of saying “We are all in this together”. That individual has just taken up two jobs paying over £1million per year. Yet, in the midst of austerity, the wealth of the richest in society has doubled. Some of us are clearly more ‘in this’ than others. Austerity is about disciplining the poor and the workers, making people unable to rock the boat for fear of losing work or benefits. We must be loud and vocal in our opposition to austerity: council elections give us the opportunity to shout clearly that we say no to austerity, we say no to privatisation, and we say no to isolating and demonising our communities. Solidarity is central to Green politics. Solidarity with women facing discrimination and abuse. Solidarity with those suffering in-work poverty. Solidarity with those facing benefits sanctions because the inhuman welfare system fails to understand their individual situations. Solidarity with those whose housing security is threatened because years of inflexible funding and poor vision have meant a lack of decent homes. But it is more than this. It also means standing with those who are targeted and isolated by the UK government because of where they come from. It means standing with those facing the barrage of sexist, racist, xenophobic abuses that we see being normalised by Trump and his administration, and by Theresa May and her approach to immigrants and refugees. We want our councils to be places of refuge, hospitality and safety for those whose lives are threatened elsewhere. We want our councils to work with local communities and organisations to provide safety and security – sanctuary – to people who have had hope stolen from them. We want our councils to build on the work many have already done supporting Syrian refugees and others, and to become places of sanctuary. And not just at a rhetorical level, but taking practical actions to welcome people. We want the world to hear us when we say: Scotland welcomes immigrants and refugees. Scotland will stand up for the rights of the vulnerable. Scotland welcomes those who choose to call this country home. We know that Greens can help create strong, resilient communities. Inclusive communities that look out for each other. Healthy and happy communities where social and environmental justice thrive. And engaged and motivated communities were participation in the structures of power and day-to-day decisions is not only possible, it is supported and expected. In the last few extraordinary years in Scottish politics, so many people have been motivated to get involved, often for the first time in their lives, in the political debates that affect them. We have a responsibility – and an opportunity – to keep alive the belief in the power of democracy – local democracy – to bring people together and affirm the feeling of solidarity between us all. Everyone deserves the chance to be a part of designing and determining the future of our communities. On 4th May, all of those aged 16 and over – yes, remember our young people are better enfranchised that they have ever been – will have the chance to play their part in shaping their futures. It is only one way of doing this, but it matters. It is up to each and every one of us here today, and our friends across Scotland, to ensure that as many people as possible vote Green. With Greens in councils across the country we can make a real, positive difference to people’s lives: fighting for social and environmental justice; safeguarding and investing in public services by securing decent pay and conditions for workers, and creating meaningful jobs; standing up for the most vulnerable members of our communities; harnessing the creativity and imagination of our citizens; and giving people power over the decisions that affect their lives. I will finish by wishing all of our fantastic candidates and their campaign teams all the very best of luck over the coming 8 weeks. Let us use these next 8 weeks to get our message out to as many people as possible. Let us use the next 8 weeks to act as though we are living the early days of a better nation. Let us use the next 8 weeks to tell the story of a future where we live, work, learn and play in communities that are supported by vibrant, caring and creating economies. A future where everyone is treated with dignity and respect, and where equality is a given. A future where everyone has power in their hands. A future that is coming. For a’ that, an’ a’ that, it’s coming yet, for a’ that!